Donna Karlin to be featured on the cover of an upcoming edition of the Women of Distinction Magazine in 2017 and the Top 10 of 2016 edition. Ottawa, Canada, January 26, 2017 --(PR.com)-- Donna Karlin, The Shadow Coach®, Certified Executive Coach, and Founder/President of The No Ceiling, Just Sky™ Institute, has been recognized as a Distinguished Professional in her field through Women of Distinction Magazine. Donna Karlin will soon be featured on the front cover of an upcoming edition of the Women of Distinction Magazine in 2017 and in the Top 10 of 2016 edition. 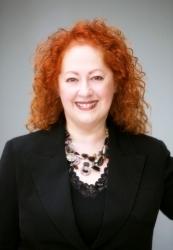 Coaching and developing sustainable leadership as a Certified Executive Coach and Principal of the No Ceiling, Just Sky™ Institute, Donna Karlin changed career paths being inspired by her son's surgeon. Born partially paralyzed and requiring plastic reconstructive surgery, Karlin's son's doctor later asked her to work with all of her future patients and she agreed. Working closely with patients and families only after returning to school and consulting with professionals across many fields of medicine, she eventually designed her own methodology, Shadow Coaching, which she now teaches around the world. "Working with parents and their children who needed everything from facial reanimation and re-enervation to working with terminally ill cancer kids, I had to wade through the 'masks' that these parents and kids wore to hide their fears during treatment and surgical interventions," Karlin explained. Transitioning from coaching long-term care and terminally ill patients to a realm where she could support healthcare awareness and change at the decision-making level, Karlin's model demanded that she expand into the corporate, government, political, and military arena. "Soon after I founded the Shadow Coaching methodology, there was a push from seasoned practitioners to learn what I had created, so I founded The School of Shadow Coaching in 2004," Karlin said. "Today I teach advanced practitioners and listen to each one of them as they learn and percolate on how to best use the model I created. I continue to evolve the methodology and how I do my work as a result. If we don't listen to those we serve, then it's about us as practitioners and not about why we do what we do." Shadow Coaching is an essential element and key tool in evolving leadership and supporting fundamental change within organizations. Specifically, it is a combination of organizational psychology, organizational systems, and human systems; situational, observational coaching between coach and client with mutually agreed upon objectives. Karlin's umbrella organization, The No Ceiling, Just Sky Institute, which houses A Better Perspective, The School of Shadow Coaching and her work with the TED Fellows community, brings a 360 degree perspective to human evolvement; a dynamic, strengths-focused, full-circle approach to leadership and organizational development. An award-winning author of the book "Leaders: Their Stories, Their Words - Conversations with Human-Based Leaders," Karlin also authored a second book, "The Power of Coaching," and has also contributed to the International Journal of Coaching in Organizations. She is active as a member of the Advisory Council for International Academy of Behavioral Medicine, Counseling, and Psychotherapy, is a member of the International Coach Federation and the International Critical Incidence Stress Foundation, is a Founding Fellow of the Institute of Coaching, Mclean Hospital, Harvard Medical School. In her down time, she does pro bono work for the TED Fellows, the Unreasonable Institute, StartingBloc, and several other non-profits. Karlin holds a certification in Organizational Psychology with a focus in Executive Coaching from the Professional School of Psychology, is a Certified Diplomate in Professional Coaching through the International Academy of Behavioral Medicine, Counseling, and Psychotherapy, and is a Certified Executive Coach through the Center for Executive Coaching. Karlin completed postgraduate studies in organizational behavior at the University of Alberta.